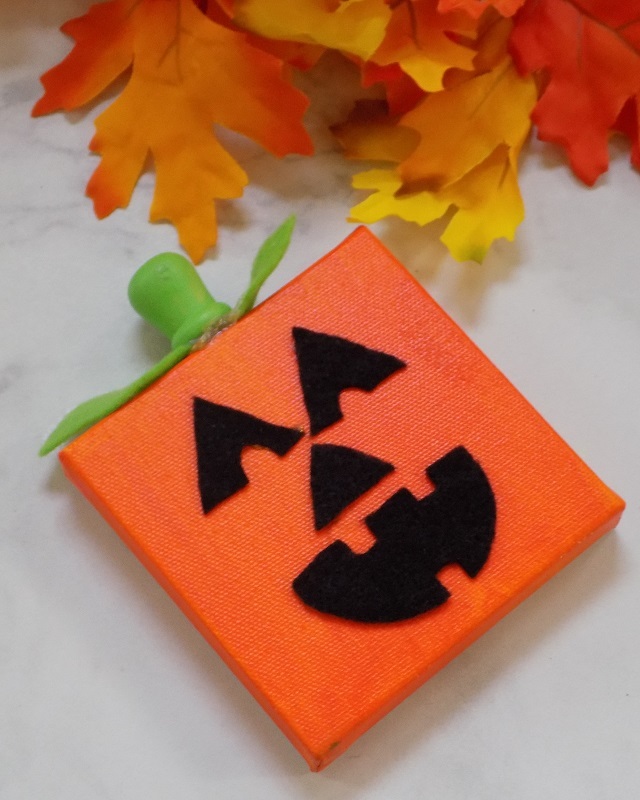 This Pumpkin Mini Canvas Halloween Kids craft is so incredibly simple to do, and the finished product is super cute too! From toddlers to tweens, this pumpkin mini canvas DIY Halloween Décor is an easy craft that the entire family can have fun with. Hi friends, how have you been? When the record breaking heat finally gave way this past weekend, it made way for record rainfall. My goodness, the weather has been a little crazy these past few months, hasn't it? Needless to say, in the whirlwind of weird weather, we've been spending most of our time indoors these past few days. I had a few mini canvases on-hand, and a few other simple supplies, so I decided to do this simple craft with my kids this past weekend. While we used multi-surface paint, you could easily use non-toxic finger paint or a fast drying paint such as Kwik Stix, with toddlers and younger kids. Read on to grab the simple supply list, and for our tutorial. 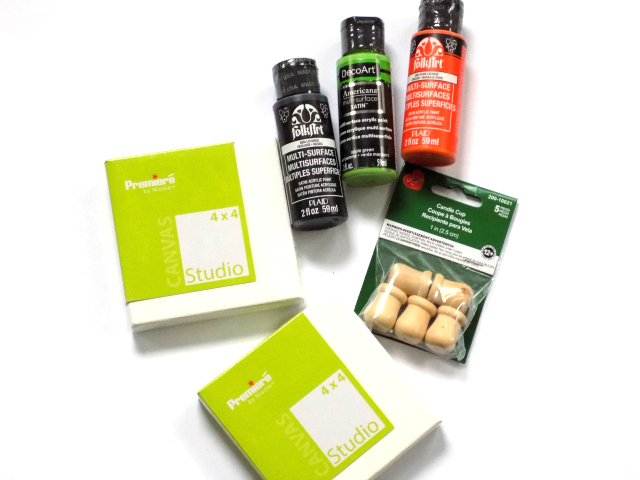 a 4" x 4" Mini Canvas - we purchased the pictured mini canvases at A.C. Moore. I've found their mini canvases to be the very best quality AND they have thick frames - which make these little mini canvases super simple to just stand up and display just about anywhere around the house. Orange paint, green paint, black paint (or black felt - we would up using felt cutouts for the toddlers - I pre-cut the pieces and had them simply glue down their jack-o-lantern / pumpkin faces. If you're doing this craft with small children - feel free to use kids paints or quick drying paint sticks like Kwik Stix - it makes this project far more manageable with little ones. A small piece of green felt. Start by painting your mini canvas orange. Set to the side allow adequate time for drying. Next, paint your wooden spool or wooden candle cup green. Set to the side allow adequate time for drying. If using paint, paint your pumpkins face on after your base coat of orange paint has dried. If using black felt, cut out two triangle eyes, a triangle nose, and a mouth. 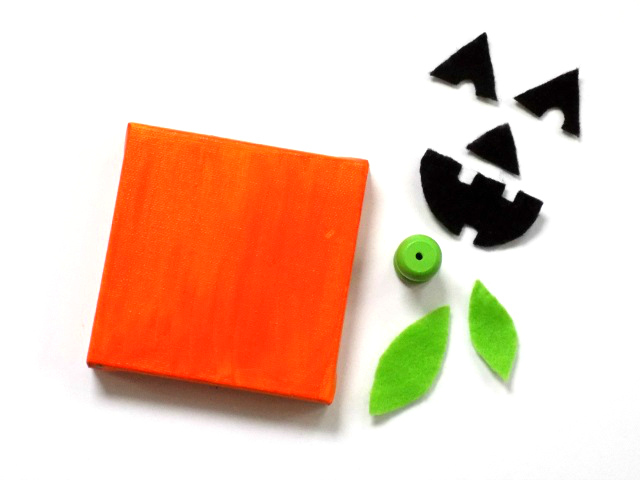 Use heavy craft glue to affix your pumpkin felt face pieces. Set to the side allow adequate time for drying. Glue your felt leaves to the top center of your canvas, and your wooden spool / candle cup top center (on top of your felt leaves) using heavy craft glue. Stand / prop mini canvas upright and allow adequate time for glue to dry. Place your completed Pumpkin Mini Canvas on a shelf / counter top to display, and enjoy OR gift your completed Pumpkin Mini Canvas to someone special. Happy Fall and happy crafting, friends!